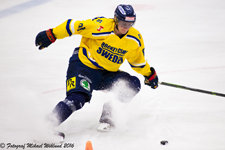 If you are interested to play ice hockey in Sweden, we have contacts with different clubs in the Stockholm area. The teams that we have contact with play in AA or AAA. They are looking for ambitious players. Our partner clubs offer some of the best programs for developing players as well as teaching ice hockey according to the Swedish ice hockey federation. The cost to play in Sweden can vary but is usually between 10.000 SEK to 25.000 SEK + room and board (3000-4000 SEK/month). You may also have to pay for transfer cost which is currently 5000 SEK (18 years and younger) and 12 500 SEK (18 years and older). We have contacts with senior, junior and youth teams who are always looking for new players. Last day to transfer is 28th of February 2017. Please fill out the form and send it to us.